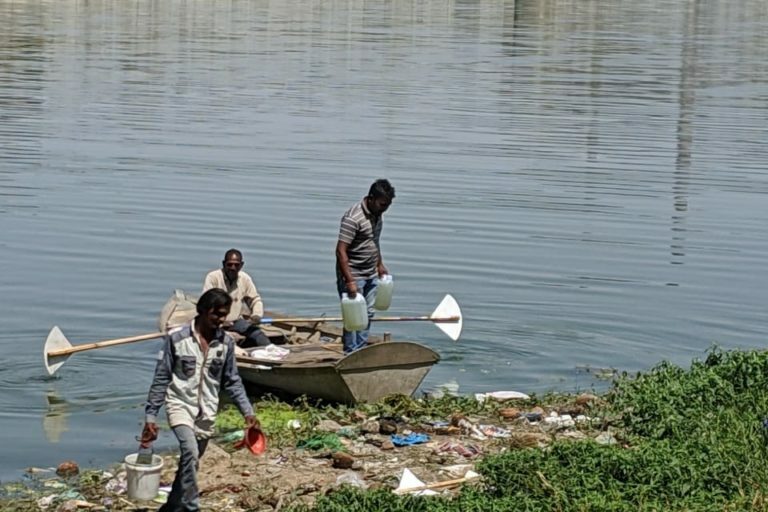 Gujarat’s Sabarmati river no longer carries freshwater when it enters Ahmedabad city as stretches have dried up or are stagnant and polluted, finds an investigation. The use of polluted waters of Sabarmati for agriculture and daily use could be harmful for human health, warns report. The political opposition, in BJP-ruled Gujarat, is planning to highlight the issue of polluted water bodies and air pollution across Gujarat in the 2019 polls. Significant stretches of Gujarat’s Sabarmati river have gone dry or are plagued with pollution, says a latest report by a team of activists and environmentalists. The river in the Ahmedabad city stretch, before the Sabarmati Riverfront, is dry while the stretch along the Sabarmati Riverfront, is brimming with stagnant water, the investigation found. The report, by non-governmental organisation Paryavaran Suraksha Samiti (PSS), also revealed that 120 kilometres of the river, before it meets the Arabian Sea, is ridden with industrial effluent and sewage. “The drought-like condition of the Sabarmati river intensified by the riverfront development has resulted in poor groundwater recharge and increased dependency on the already ailing Narmada River,” said the report. The report investigated compliance to a February 2017 Supreme Court order regarding industrial effluent and sewage discharge into the Sabarmati river stretch of Ahmedabad district. The Supreme Court’s order was on a writ petition filed by the PSS against the Union Government and others regarding the polluted state of the Sabarmati river. The court had ordered the GPCB to ensure that the polluting industries to treat their effluents and municipal authorities to treat sewage before being let into the river. The activists, in a statement, said that their investigation raises fundamental questions against both, the polluting industries that discharge their untreated effluents into the Sabarmati river, and the Ahmedabad Municipal Corporation that discharges their poorly treated, untreated sewage into the river. They emphasised that the GPCB failed in its duty to protect the Sabarmati river’s water quality despite orders of the SC and the National Green Tribunal, which sought strict compliance of effluent treatment standards, continuous monitoring and closure of defaulting industries. Samples were taken by a team of four members – Rohit Prajapati and Krishnakant from PSS, Mudita Vidrohi from the Gujarat Lok Samiti and Subodh Parmar, an advocate of the Gujarat High Court – in the presence of the of the Gujarat Pollution Control Board (GPCB) officials who also took samples. Vidrohi of the Gujarat Lok Samiti said they got samples tested in a separate government approved laboratory while GPCB tested in their own laboratory. “The results that we have published are the one that the GPCB has given to us. We have our own results also which are even worse. But to make it authentic and credible we have used the GPCB data,” said Vidrohi. According to the study, the levels of Total Dissolved Solids (TDS) and Biochemical Oxygen Demand (BOD) at the Sabarmati river downstream were nearly nine times and 150 times more than the prescribed limits. Similarly, at the Sabarmati Riverfront, the levels of TDS and BOD were nearly 1.33 times and nine times more than the prescribed limit. An investigation by activists reveal pollution in water in the Sabarmati river. Photo courtesy of Mudita Vidrohi. Originating in the Aravalli hills in Rajasthan, Sabarmati river meets the Arabian sea in the Bay of Khambhat area after traversing a distance of 371 kilometres. It has a total catchment area of 21,674 square kilometre. Sabarmati Riverfront is a Gujarat government project which includes creation of 11.25 kilometres of public riverfront on both banks of the Sabarmati river in Ahmedabad. The development work includes major interceptor sewer lines to control pollution on the river banks. “The existing norms about the release of STPs (sewage treatment plants) and CETP (common effluent treatment plants) discharge in river are prepared on the assumption that a river is flowing. 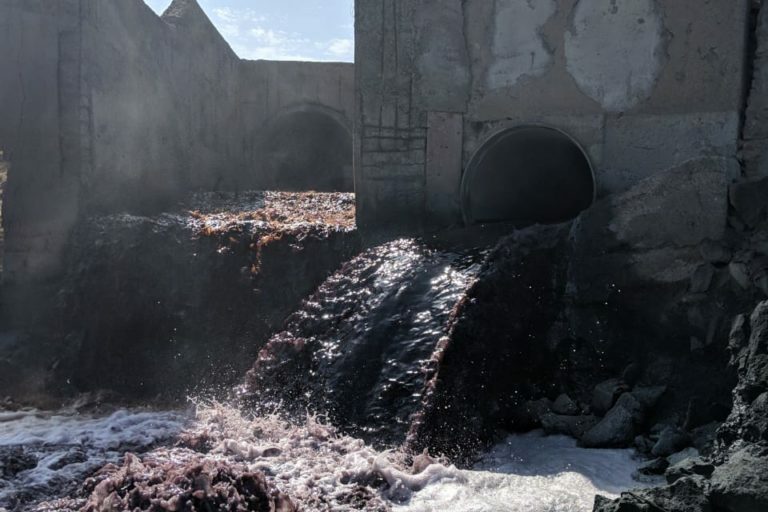 So when the treated industrial effluent and sewage is released into the river, it is believed that the waste will be diluted further by mixing with the water, making it less harmful. But the reality of Sabarmati river is that it does not have even a drop of water flowing into it. So, whatever flows into Sabarmati river beyond Ahmedabad till it meets the Bay of Khambhat after 120 kilometers is only untreated or ill-treated STP and CETP discharge,” Vidrohi told Mongabay-India. Manish Doshi, who is the chief spokesperson of the Indian National Congress party, Gujarat, said that environment is one of the critical issues for his party in the 2019 elections. “In Gujarat, water resources including the Sabarmati river, are highly polluted. The issue of water and air pollution is a key component of our manifesto for the 2019 elections. This issue is directly connected with the lives of people of Gujarat,” Doshi told Mongabay-India. Activists warn that usage of polluted Sabarmati water for agriculture is an issue of grave concern. Photo courtesy of Mudita Vidrohi. Explaining further, Doshi said that the issue of pollution in Sabarmati river directly concerns three of the 26 Lok Sabha seats in Gujarat – Ahmedabad East, Ahmedabad West and Gandhi Nagar. “It (water and air pollution) will be an important issue for our party in not only Ahmedabad area but across Gujarat. We do not support development which comes at the cost of destruction of natural resources. This model is not acceptable to us,” Doshi added. All 26 seats of Gujarat, currently with the Bharatiya Janata Party in power, are going to the polls on April 23. According to the data of the Central Pollution Control Board (CPCB), of the 351 polluted river stretches identified across India, 20 are in Gujarat. Read more: Are clean rivers a distant dream for India? The investigation report called for urgent action to rejuvenate and restore the Sabarmati river and its water quality. It demanded from the GPCB to immediately issue closure notices to all the defaulting industries and the CETPs in Ahmedabad’s industrial clusters, in the implementation of the SC’s order. It also demanded from the GPCB to issue notices to the municipal commissioner of Ahmedabad to ensure all the sewage treatment plants in the area comply with the order. “GPCB should file criminal cases against all owners/directors of the defaulting polluting industries, the officers of the CETPs, and the municipal commissioner of Ahmedabad,” the statement from activists said. “The most worrying factor is that everyone – pollution controlling authorities, government and the local civic bodies – know about it. The riverfront is filled with Narmada waters and it is stagnant because the water is stopped at Vasna Barrage to maintain its levels in the riverfront. Unfortunately, people are still not standing up and seeking clean rivers. Recently, fishes in the Sabarmati riverfront have died in large numbers due to almost zero oxygen in water. As the heat increases, the condition is going to get even worse,” she added. Meanwhile, the activists further demanded that GPCB investigate groundwater contamination as well as contamination of the food grains, vegetables and fodder by the polluted water of Sabarmati. The activists sought an interim compensation for farmers who are forced to use contaminated Sabarmati river water and groundwater for irrigation of agricultural land and asked for medical services for the farmers and villagers who suffered from the pollution. Banner image: Water and air pollution in Gujarat would be a critical issue for the opposition in the 2019 elections. Photo by Ashesh Shah/Wikimedia Commons.